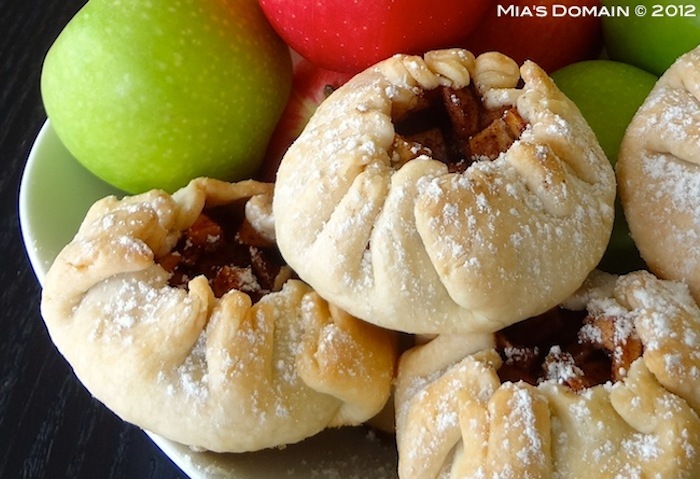 Combine apples, raisins sugar, orange peel, orange juice, and apple spice blend. Set aside for 30 minutes. Combine flour, guar gum, and sea salt. Rub butter into the flour mixture with your finger tips until it resembles fine breadcrumbs working as quickly as possible to prevent the dough becoming warm. Add ice water to the dough and using a cold knife stir until the dough binds together. Add more water a teaspoon at a time if the mixture if too dry. Wrap with plastic wrap and refrigerate for 30 minutes. Divide dough into 12 pieces and roll each on a floured surface into 6"circles. Place tablespoonfuls of fruit in the middle of the pastry circles. Fold up the edges of pastry, leaving center uncovered. Brush folded pastry with egg wash.
Bake for 30 to 40 minutes or until pastry is browned and cooked. Thanks so much for sharing these beautiful little pies - I love that you took the time to make the crust from scratch. Thank you for also including the name of the brand of baking mix you used - generally I wouldn't consider a pre-made mix to be "from-scratch" per the Made with Love Mondays challenge guidelines, but Bob's Red Mill products are fantastic and there are none of the pesky preservatives. Welcome to the series and I'm so glad you decided to share! Thank you! The mix that I enjoy baking with is a three blend of GF flours with baking powder and xanthan gum added saving me time and money mixing my own blend. I would question the fact that some of the recipes submitted use ricotta and some other type of cheese (mozzrella). Are they made from scratch? You have inspired me to try and make my own crusts! I have been nervous to try but you make it look so easy!! !